Holy Trinity works with St Paul’s and Holy Innocents in support of the Haringey Churches Winter Night Shelter. As part of this project, we open our doors one night a week from December through to March This a project run by the local charity to welcome homeless guests to stay in the church overnight. We provide an evening meal, washing facilities, clothes, a bed, breakfast the following morning and lunch to take with them. Our shelter is not just about providing a bed for the night. One of the most important things we offer is a warm welcome to guests who have perhaps been on the street all day. A rolling team of volunteers cook the evening meal so that everyone can sit down together and share their time. We can only offer this work because of the generous help and energy of so many people within and without our community. There are lots of church volunteers and volunteers from the local community who help each week with the running of the shelter. 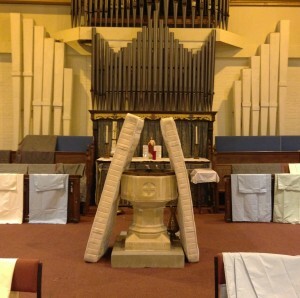 The volunteers also help to set up the beds in the church, provide a cooked breakfast in the morning and clear away. A small number also stay with the guests for the night. Many of the people find the experience hugely rewarding and it is encouraging to see the Church extending its ministry to those we are called to serve. We are also this year running a drop in session on a Tuesday morning, which is a new contribution from us for 2012-13. This is a more informal occasion when we keep the church open for a few hours from 9-1 for volunteers and guests to drop in and find a friendly face as well as tea and cakes or sandwiches. This provides extra respite from the cold and a chance for everyone to get to know each other a little better over a warm drink. We also hope to provide other services – from hairdressing to accessing the internet – which our guests can make good use of. 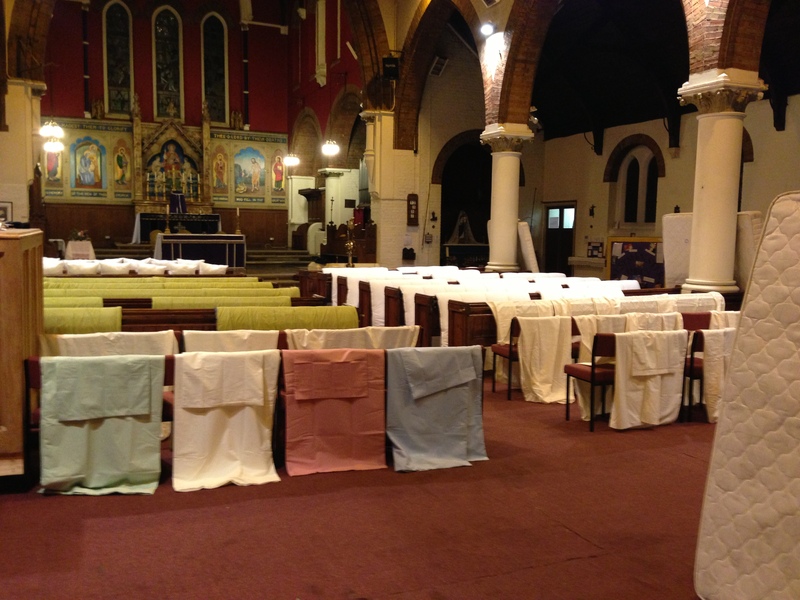 The Haringey Churches Winter Night Shelter project runs across a number of churches in the area so that guests always have somewhere to stay for the night. This is co-ordinated centrally as a directive of the charity All People All Places, who manage the referral of guests through local agencies as well as helping them to find more permanent accommodation. The shelter coordinator has worked tirelessly in moving guests into more stable accomodation as quickly as possible, and over the three years the project has been running, 82% of our guests have found more stable accommodation and work, which shows how well the project is run and how worthwhile a venture it is. We are still in contact with many of our past guests, who always let us know how appreciative they are of our help. The huge success of much of this work is done by hugely committed people – all of whom at the moment are volunteers. 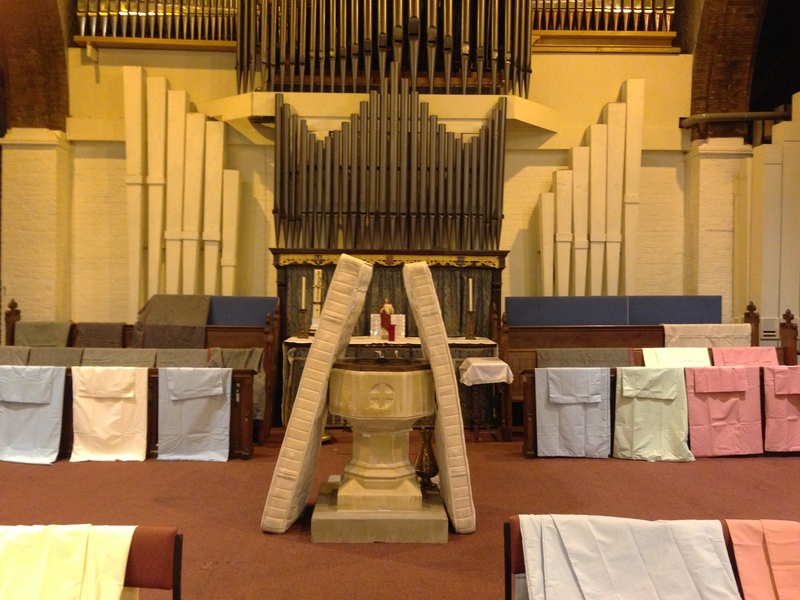 Many people from Stroud Green, Crouch End and Hornsey have taken part in volunteering with the shelter, not just those connected directly with the Church. Teachers and parents from our local schools have taken part in the project and have helped cook evening meals and breakfasts. Local schools have enjoyed bringing classes along to Holy Innocents during the shelter to learn about issues around homelessness and what happens at our shelter. 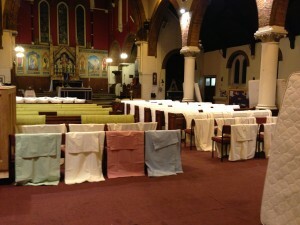 School children have also taken part in setting up beds and tables in preparation. Local people have also been very generous in supporting the project financially. Moors Bar on Park Road have been hugely supportive in raising lots of money for the shelter with special fundraising concerts and film nights. Dunn’s the baker on Crouch End Broadway support the shelter by giving delicious food to the shelter every week. We are very grateful to all who have helped in so many ways to help with this excellent work of providing shelter to those who might otherwise sleep rough on the streets of our city. We are always looking for more volunteers to cook or to spend time at the Winter Night Shelter, or who can donate utilities (toothbrushes, toothpaste, bedding, towels &c.) or money to this project. Whatever you can give is gratefully received, and we hope to encourage those who might, for example, wish to offer skills and time in cooking but feel unable to provide for the cost of the meal. Food and heating costs are our main weekly outlays, and we are always grateful for help in footing this bill. The Haringey Churches Winter Night Shelter, a charitable organisation which does not make a profit, is also looking to employ a co-ordinator to ensure that we maintain the high percentage of success in finding accommodation for our guests, at a cost of around £28k per annum. There is an information leaflet telling you about some of the volunteering opportunities available as well as the volunteer information pack produced for the Haringey Churches Shelters. You could also take the details of the charity Street Link, who maintain a central database and contact forum for rough sleepers and charitable associations able to help them. If you would like to get involved in any way please contact the co-ordinator of the Holy Innocents Winter Night Shelter, Max; one of the Priests; or the other Pastoral Assistant, Damien. You could also sign up to our mailing list – we don’t e-mail everyone very often, but it helps to be able to contact everyone at once for occasional important updates!